We are delighted to have been awarded the Princes Teaching Institute Mark for the fourth year running and in addition following a successful submission of evidence to the Geographical Association we have been re-designated as a Centre of Excellence and recipient of the Secondary Geography Quality Mark for the next 3 years. Our Centre of Excellence status recognises the work we are doing to disseminate good practice in geography locally and nationally, providing professional support and ideas in a wider context beyond the department. We would like to thank staff and students for all their hard work in helping us to be successful in gaining these awards. 138 of our Year 8 students took part in a fun filled trip to support their 'Rivers' topic work back in September run by the Grafham Water Centre providing students with the opportunity to consolidate what they have been learning about in the classroom. The day started at Brampton Mill, canoeing on the Great River Ouse. enabling them to explore a variety of river landforms, including a flood plain, river cliff and slip-off slope and explore the river processes involved in their formation. The afternoon involved developing map skills such as 6 figure grid references through an orienteering activity at Grafham Water, culminating in a team building challenge. 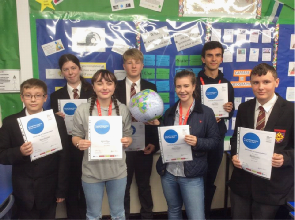 We now have 13 students who have signed up to this year’s Geography Ambassadors programme supporting the work of the department and helping to raise the profile of our subject during the year. 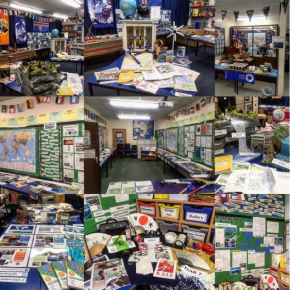 Some of our ambassadors have already helped out at the recent Open Evening and over the next half term they will be supporting a number of lower school geography activities. A number of KS4 and KS5 students took part in our Geography House competition. Mahil (Year 12 - Crosier) and Megan (Year 10 - River) won the school house competition, gaining 50 house points and a £10 Amazon voucher each. The top 7 entries from across KS4/5 have also been entered for the RGS's 'Geographer of the Year' competition. The entries consist of posters (KS4) or essays (KS5) exploring the question "Our Favourite Place" giving students an opportunity to research and develop the physical and human processes that have shaped a place and which have determined the characteristics and identify it has today. Our Year 13 students are currently in the midst of writing personal statements and preparing their UCAS applications. We have several resources on our website to support students through this process. Whilst there is specific support for those wishing to study Geography at University, there are many resources regarding UCAS and writing personal statements which should be useful to all of our students regardless of the course they are applying for. Our supporting resource page can be found here: http://www.geobytes.org.uk/geographyuniversity.html.